Get ready to be swept away by the mountain serenity in this dreamy editorial shoot from Victoria Masai Photography! 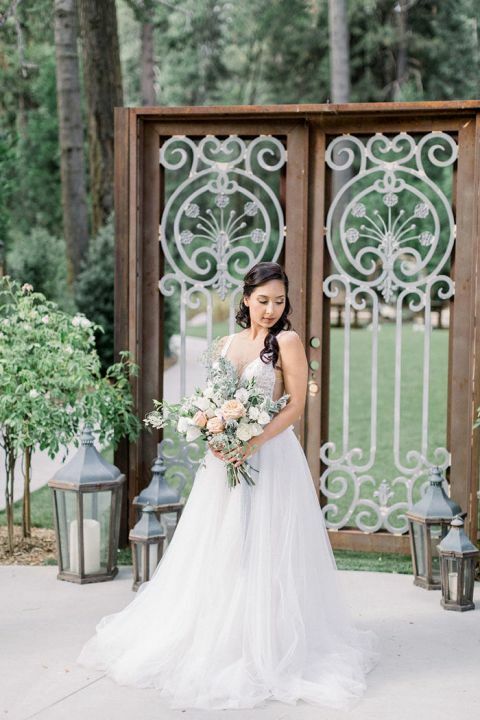 The breathtaking setting in the San Bernardino National Forest made SkyPark Weddings the perfect location for this wedding day that looks straight out of a fairytale! The stunning collaboration with Stephanie Weber Photography and Bloom Theory Design came to life with an outdoorsy couple combining their love of the mountains with vintage glam style! 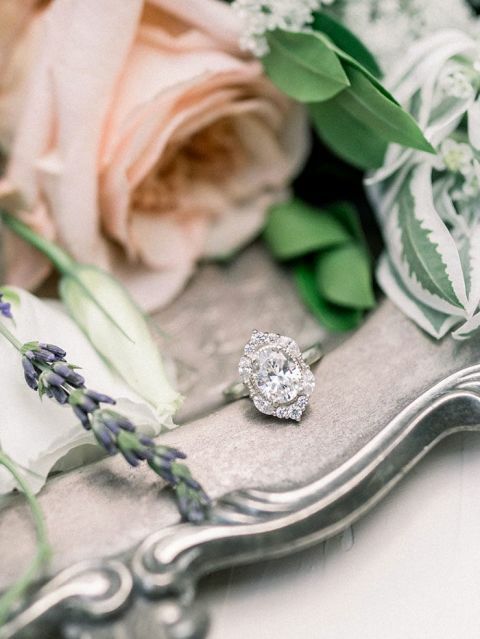 The engagement ring from Rings by Bethany Crandell set the tone for the shoot, with a gorgeous oval diamond in a vintage-inspired setting. 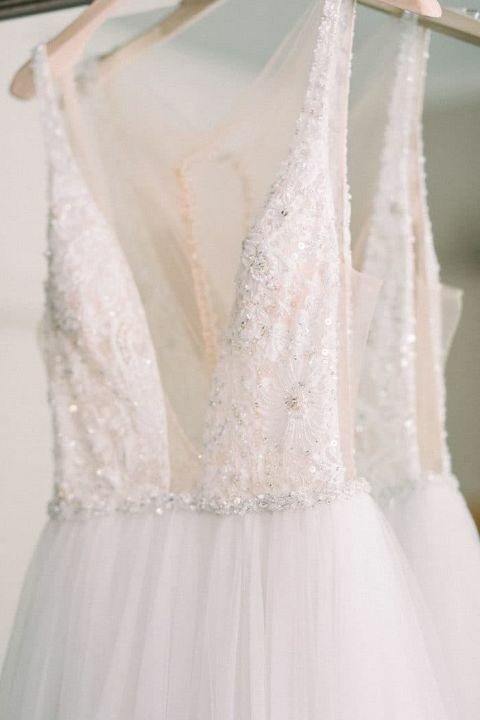 The glamorous style fit beautifully with the romantic and daring wedding dress by Allure Bridals from Mariposa Bridal Boutique – the plunging neckline added an adventurous element to the classic A-line silhouette and romantic beaded bodice! To celebrate the serene beauty of the forest surrounding SkyPark Weddings, Bloom Theory Design created a wreath ceremony backdrop adorned with greenery and romantic peach flowers. The woven wood wreath combined modern geometric trends with organic elements that beautifully suited the natural beauty of the setting! The couple are not only gorgeous together, but a real couple who wiped away tears while reciting their vows to each other for the first time! 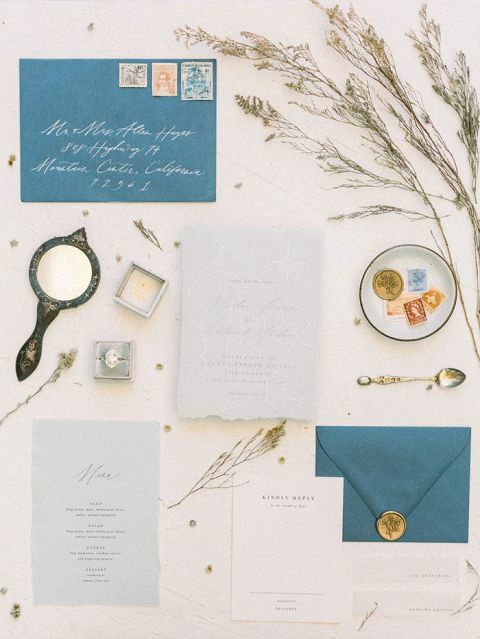 Touches of blue and lavender played into the romantic whimsy of the shoot for the reception decor – a rustic wood Sweetheart Table and posh linen chairs from AKT Party Rentals were elevated by a silky blue runner, vintage silver candlesticks, and wooden lanterns to play up the organic surroundings. Sam Samm Custom Cakes crafted the signature color palette into this stunning hand painted wedding cake! A vintage breakfront created a stunning dessert display to finish off the rustic reception!